Clue with cards? And plants? And with more Asian flair? I could go for that. 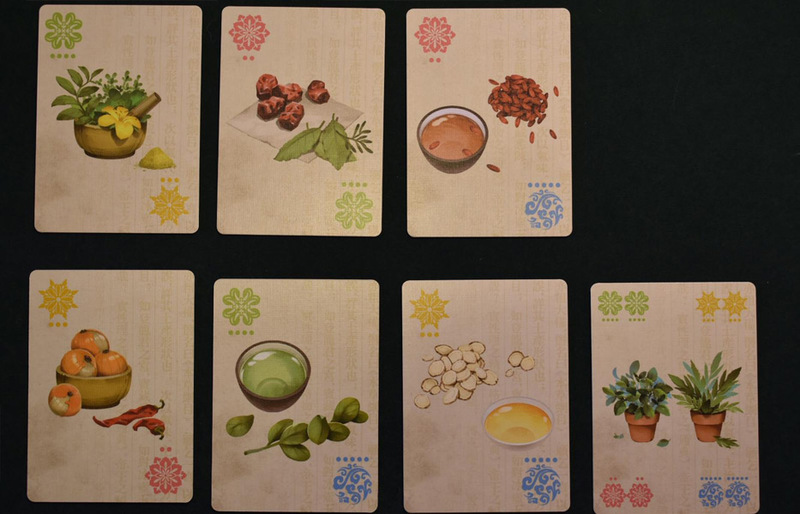 Herbalism, a three- to four-player game from EmperorS4 and Deep Water Games, places you in the role of a novice pharmacist, which is a lot less sketchy than it sounds. Maybe. The game takes place hundreds of years ago, and you are seeking to find the cure to a plague that is attacking your country. “Oh, so it’s like Pandemic, and you’ll all be working together, right?” No, you silly fool! Instead, you’ll be competing against each other to become the “God Farmer”. Because plagues are the time in which you should really be trying to make a name for yourself. You are given a handful of cards, each of which features one of the four types of plants available in the game. These plants are featured on different numbers of cards, so some are more rare than others. All of the cards are distributed to players except two which are hidden off to the side. Turn by turn, you’ll be trying to figure out the identity of those two cards by taking different actions that force your opponents to share information. This could mean that they have to tell you how many of a particular color they have, or giving you one card of two different colors, or maybe even all of one color card. Some of these actions are just asked, while others require you to give a card to your opponent. All of this card movement means that players will rarely have the same cards from turn to turn, and that’s where the challenge of the game lies. You’ll need to keep track of how the cards you know about have moved around the table, while also trying to figure out where the other cards are. Eventually, one player will guess what two cards were hidden at the beginning of the game, and all other players have the opportunity to agree with them or to pick a combination of cards of their own. The cards are revealed, and players are awarded points based on the results. Once a player reaches a particular number of points, they win! When we jumped into this game, I was immediately reminded of Clue. While I haven’t played that game in a long time, I remember sitting there with the cards in my hand, trying to maneuver my way around the board to ask other players questions and check off options on that little piece of paper I had. I also remember the rush of opening up that little envelope to see if the guess you had made was correct. This game has several of those elements, but the experience is more streamlined and complex. One thing that was always frustrating about Clue was the die roll – if you didn’t roll well, you wouldn’t be able to find out information for a long time. In Herbalism, there are a few limitations on what you can do from turn to turn – you can’t ask about the same colors each time, for instance. However, that still allows for so much more freedom. I never felt like I couldn’t find out new information because of any of the move limitations. I also really like the movement of cards from one player to another in a variety of ways. This forces players to make a bit of a sacrifice of knowledge in order to learn new things. You can’t hoard all the cards because that allows the other players to get lots of information from you. You also can’t sit with too few cards because then you’ll be left relying on what the other players have. It’s important to strike the proper balance, and that means adding variety to the types of moves you take each turn. This game mostly takes place in your head, and I know that might not fly for some people. It almost feels like you’re card counting – thinking through how many cards a person has, what colors you know are in hand, what colors you know are elsewhere, what moved from their hand to someone else’s hand last round…. all while trying to avoid giving away too much information. In our games, we didn’t write down any notes, but you certainly can if your gaming group prefers that. Either way, you’re going to be challenged to figure out what’s going on. 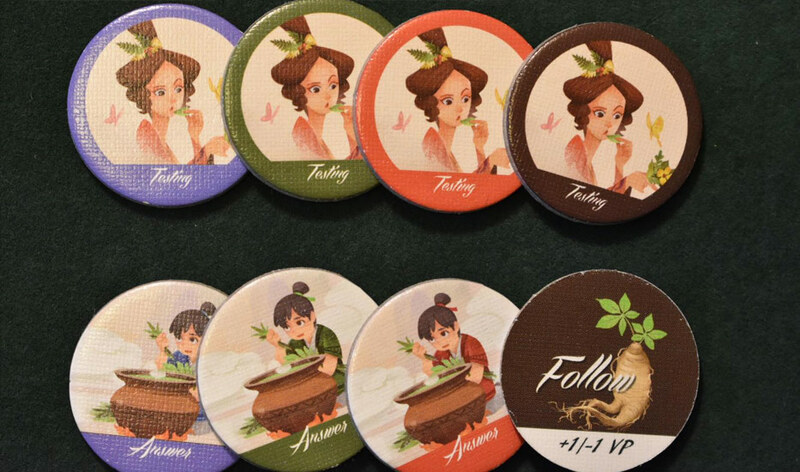 You can purchase Herbalism through the game’s website, on Amazon, or at your local game store. Deep Water Games provided us with a retail copy of Herbalism. This in no way influenced our opinion on this game.